Described as 'the ultimate one-box digital radio', the Revo iBLIK RadioStation combines an FM tuner, DAB digital radio, internet streaming broadcasts over Ethernet or WiFi, an iPod dock and a port for connecting any audio device with a headphone socket. It also has an alarm and you can stream music from your iTunes library. So no shortage of features, but how do they shape up? iBLIK RadioStation is easy to set up and operate. Navigating your way through its well-organised menu system is never a chore, and even connecting to the internet through WiFi is a simple task. Internet radio gives access to more than 11,000 stations, with more added all the time. Exploring them is simplicity itself, though navigating to a specific station can be time consuming. Thankfully, you can use the online Frontier Internet Radio Portal to store a favourites list, and there are ten presets each for internet, DAB and FM stations. RadioStation is compatible with DAB+, the next-gen DAB system, and if you can't tune in digitally, scan for an FM station with the aerial. 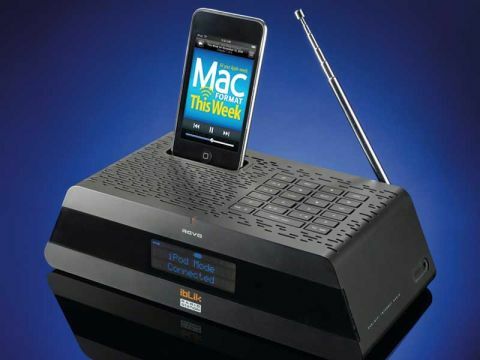 The iPod dock is a new addition for the iBLIK, and uses Apple's patented docking system where you slot in the caddy that fits your iPod classic (fourth generation or later), nano, mini, shuffle (second gen or later) or touch. Although not listed on the packaging, it's also compatible with the iPhone in Airplane Mode. Audio streamed from the iPod is organised into playlists, albums, and artists, just like when you play it natively from your digital audio player. As well as a dock, there's also an MPort – a 3.5mm socket through which you can connect any audio player offering a headphone port. Stream music from your Mac by installing Elgato Systems' EyeConnect and access your iTunes library using the Universal Plug 'n' Play (UPnP) standard. Some might criticise the fact that iBLIK RadioStation is mono out of the box, but it still offers a great sound, with plenty of volume and bass. You can use the phono sockets to add your own stereo speakers or integrate it into your existing sound system. But these are minor moans. With other manufacturers piling on the features at the expense of usability, it's great to see care given to an interface that's easy to use. This is arguably the best multifunction digital radio in its price class.